God did not create you, put His Spirit inside for you for you to sit around and do nothing for the Kingdom of God! WE ARE IN THE FATHER! 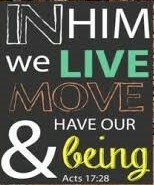 WE LIVE IN THE SON! WE HAVE MOTION & MAKE PROGRESS IN THE HOLY GHOST! The fault Paul seen with believers was not that they were puffed up with conseat or pride but, they had a low self esteem. They went around thinking they were unworthy of eternal life ... They did not realize who they were and power was inside them. They did not know their purpose, their destiny in God.